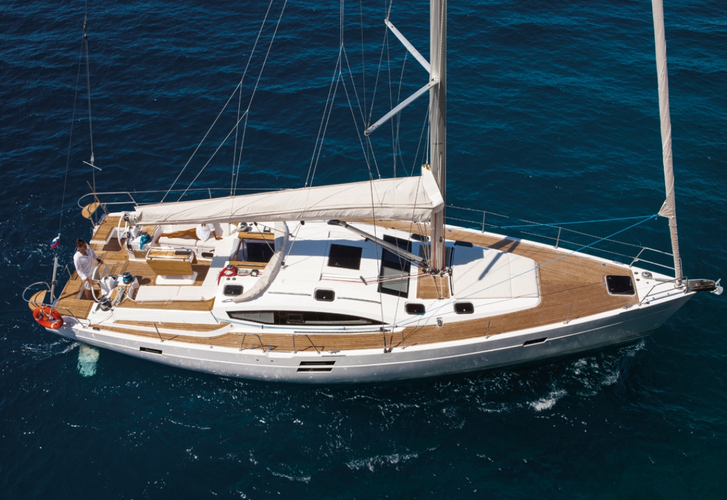 Yacht Elan Impression 50 called Alegria has been produced in 2018. We propose this yacht from marina Biograd around Zadar. Alegria is licensed for 12 persons. Layout of the vessel is 12 (10+2). Elan Impression 50 Alegria is equipped with 5 cabins. For comfort of passengers there are 2 bathrooms. With engine 80 Alegria can sail really fast. Alegria is 15.20 meters long and 4.68 m wide. Depth is 2.23 m. See more yachts under this link: Yacht charter Biograd. Sailboat's equipment includes : Radio / cd player, 2 refrigerators, Air conditioning, Heating, Gps plotter, Autopilot, Bimini top, Dinghy, Anchor electric windlass, Bow thruster, Freezer, Furling mainsail. . Security deposit is at the level of 2500.00 EUR. Choose our offer and enjoy your vacation on the deck of Alegria. This Elan Impression 50 from Biograd from Croatia Browse for by moving to this section: Yacht charter Croatia.